Object: Several different types of bread. For thousands of years bread has been one of the most important parts of our diet. Bread comes in all shapes, sizes, and flavors. 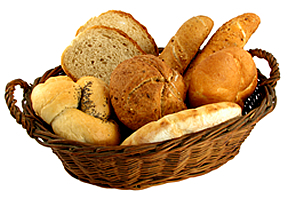 Bread is often baked into loaves, muffins, bread sticks, buns, bagels, and flat breads like tortillas. We love to spread things on our bread — things like butter, jam, honey, creamed cheese, and peanut butter. Most of us probably eat bread in some form every day. What is your favorite kind of bread? What is your favorite way to eat bread? As far back as Bible times, bread was very important to life. You may remember the time when the Israelites were starving in the desert. Every morning God sent bread from heaven for the people to eat. I'm sure you also remember the time when Jesus fed a crowd of 5000 people with just five loaves of bread and two small fish. Do you remember when Jesus taught his disciples to pray? He taught them to say, "Give us this day our daily bread." Yes, bread is, and always has been, a very important part of life. Bread tastes very good, and when we are hungry, eating bread is a good way to satisfy our hunger. But guess what? Tomorrow we will be hungry again! What if there was a bread that we could eat and not be hungry again? Wouldn't that be great? Bread can provide vitamins and minerals to help us grow strong and healthy, but eating bread won't help us live forever. Wouldn't it be wonderful if there was bread which, if we ate it, we would live forever? Well, there is! Let's call it heavenly bread. It is bread that came from heaven. After Jesus fed the 5,000 with five loaves of bread and two small fish, many people followed him. The only problem was, they followed Jesus, not because of his teaching, they followed him because he fed them. Jesus said, "You come looking for me because you ate the loaves and had your fill." Then Jesus told them, "The bread of God is the bread that comes down from heaven and gives life to the world. I am the bread of life. Whoever comes to me will never go hungry. I am the living bread that came down from heaven. Whoever eats this bread will live forever." Jesus is the heavenly bread that satisfies our hunger. He is the heavenly bread that gives us eternal life. Eat the bread that came down from heaven. Eat and live. Our Father, we thank you for sending Jesus, the living bread, that we might have eternal life. In Jesus' name we pray. Amen.